Monogram had the pleasure of partnering with Kris Jarrett of Driven by Decor on her kitchen remodel earlier this year. The end result is completely elegant and beautiful, and one we are sure her family will enjoy for many years to come! In a recent blog post, Kris wrote about the appliance features she loves after using them for the last three months. 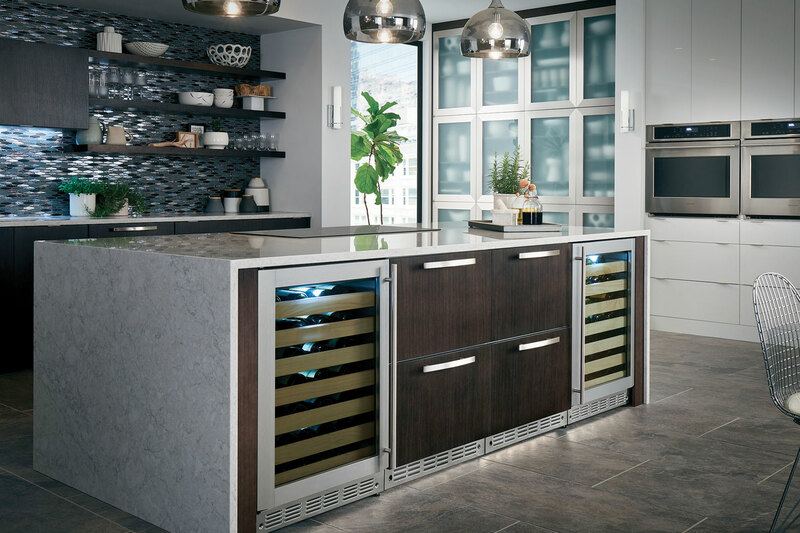 Appliances are a critical feature of any kitchen remodel so it’s great to hear Kris’s thoughts on the importance elements to consider when making that decision. Some features were included in her initial requirements but some were surprise benefits! The team at Ivy shared “20 Things You Should Know About Working With An Interior Designer” on their site and we felt the information would be very helpful for anyone working with an interior designer on a home project. Tell us what you think in the comments! Our friends from Home Polish asked the experts at Monogram what kitchen trends are on the rise in the coming year. Get in the know now in their magazine. Does it go in the middle of the drawer, on the edge or nowhere at all? Get advice on where to put the knobs and pulls from the article San Francisco designer Barbra Bright wrote for Houzz. Entertaining in the spring can be a lovely way to throw off the gloom of winter. A great spring table is at the heart of a springtime gathering. It will boost the energy and spirits of guests just by looking at it. Here are five tips to set up the perfect spring table that will leave your guests delighted. 1. Show off seasonal produce. A good spring soiree needs to exude a feeling of freshness. There’s no better way to do this than to highlight local, seasonal produce. Arrange fresh flowers purchased at a local farmer’s market. You could also make a display of seasonal fruit and herbs to use as a centerpiece. Lay a sprig of fresh rosemary on each plate along with a name. 2. Don’t forget that food and drink can be part of the display. Arrange a crudité platter featuring spring vegetables and pepper the table with small bowls for other snacks. Set up a drink station, featuring a selection of infused waters featuring springtime favorites like citrus fruits and berries. This can be as pretty to look at as it is refreshing and delicious to drink. You can also make fancy spring ice cubes, by dropping a berry or a citrus slice or some herbs into your ice cube tray before filling with water. A good group activity can make your guests more engaged, so why not let them help with some of the decorations? Get a selection of fresh flowers and gather a collection of lovely vases. Then, let your guests create their own floral arrangements while mingling. This is a great activity while you’re occupied in the kitchen. It also lessens a bit of your workload. Let guests take home some of the creations at the end of the gathering, for a special memento of the event. Spring is a colorful awakening from the gray days of winter, and your spring table should be bursting with colorful energy. Take your inspiration from nature, with springy greens, bright citrus colors, and robin’s egg blue. It’s a good idea to use these colors as accent colors along with a more neutral palette. Stick with white or cream dishes, as these are generally the most flattering for food. 5. If dining outside, include weather-appropriate accents. An outdoor party in the spring can be delightful, but it can also be a little tricky. One way to manage the unique temperature concerns that come with a springtime party is to include some decorative but functional accents. An umbrella to block the sun is a good idea earlier in the day. As the temperature drops down into the evening, it’s nice for guests to be able to easily grab a throw to cozy up with. A colorful throw on the back of each chair is a thoughtful way to anticipate the needs of your guests, but it also looks lovely and can be a part of your overall color scheme. Jessica Kane is a writer for Silver Superstore, the online leader in silver flatware, gifts, replacement pieces and more! Monogram Design Center’s Chef Jon was in the kitchen this week making Nuremberg sausage, a traditional German bratwurst, from scratch for a delicious big game party today. Having grown up hunting with his family in Northern Michigan, Jon is a pro in all things meat related. Making sausage always brings Jon back home. He typically makes different types of homemade sausage a couple of times a year. Luckily, the Chicago team was able to witness the process and we learned that homemade sausage is fairly easy to make. Not to mention, much better for you. First things first: safety and sanitization. Jon’s number one rule for making sausage is to keep everything cold. If there is any down time during the process, whether you’re taking a break or whipping up another batch, keeping your meat in the refrigerator is going to prevent bacteria from growing and spreading. Keeping the meat cold will also prevent the fats from rendering, which will be useful in the grinding process. He also recommends wearing gloves during preparation, this makes for a quicker process in general and not having to be concerned with having raw meat all over your hands. Cuts of meat: Jon’s recipe calls for brisket, pork shoulder and belly. Seasoning: Jon’s recipe calls for: salt, ground white pepper, ground mace (the aril that covers the nutmeg seed), ground nutmeg, and marjoram. Pretty simple! Step 1: cube the meat into 1- inch pieces. Step 2: Season your meat. Seasoning meat before grinding is important because during the grinding process, the different cuts of meat and seasoning will be combined more thoroughly if they have been mixed together once already before grinding. Step 3: Grind your sausage using a meat grinder twice. Next, you are ready for casing! Chef Jon hard at work making Nuremberg sausage at the Chicago Monogram Design Center. Casing the sausage: Jon used natural casings sourced from a local Chicago market that were packed and cured in salt. Sausage casings can be tough to find in certain areas, so you can always order good quality casings online. Before stuffing, you must soak the cured casings in water for about 30 minutes. Jon uses a countertop tool made specifically for stuffing the casings. Alternatively, collagen casings are easily found online too. What to do with Nuremberg Sausage: Chef Jon says the best way to prepare a Nuremberg sausage is to heat it up in a frying pan with some butter, whip up (or purchase!) some sauerkraut, and serve on a toasted bun. Yum. Something tells me tonight’s gathering at Chef Jon’s is unbeatable!